This L.A.-born shortstop was signed by the Cleveland Indians in 1931 and two year’s later he was the Tribe’s starting shortstop. An adept contact hitter, Knickerbocker might have become one of Cleveland’s all-time great shortstops if he didn’t have to actually play the field. This guy made 125 errors at that position during his three-and-a-half seasons as an Indian. So even though his lifetime average was a lofty .293 at the time and he was only 24-years-old, when his error total reached 40 during the 1936 season, Knickerbocker was traded to the Browns in January of the following year. After his only season in St. Louis, he was dealt to the Yankees. 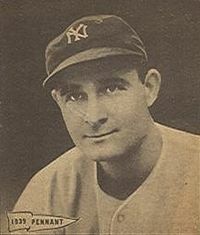 New York had just released veteran second baseman, Tony Lazzeri following the 1937 World Series. Joe McCarthy intended to replace him with rookie Joe Gordon, but he wanted a safety valve just in case the kid wasn’t ready for prime time. Fortunately for today’s Pinstripe Birthday Celebrant, Yankee shortstop Frank Crosetti suffered a leg injury during spring training and Knickerbocker got plenty of opportunities to show the Yankee skipper his lively bat more than made up for his less than average glove work. Sure enough, Gordon got off to a horrible start at the plate in ’38 and by May 1st, he was back in the minors and Knickerbocker was starting at second for New York. The move to the new position actually improved his defense and he set a career high in fielding percentage during his first season in pinstripes. In the mean time, Gordon got his stroke back down on the farm and when he returned to the parent club in June, his torrid bat helped propel New York to the team’s third straight World Championship. The only one who suffered from Gordon’s emergence as an all star was, of course Knickerbocker, who saw action in just seven games during the final three months of the ’38 season and completely sat out that year’s World Series sweep of the Cubs. In 1939, Knickerbocker had pretty-much a no-show job as Gordon started all but three regular season games at second for New York and Crosetti missed just two starts at short. In 1940, Knickerbocker saw prolonged stretches of playing time at both short and third due to injuries to Crosetti and Red Rolfe. His defense was again better than average though his offense was disappearing, no doubt due to the lack of playing time. That December, New York traded Knickerbocker to the White Sox for catcher Ken Silvestri. Following the 1942 regular season, Chicago put him on waivers and he spent the ’43 season playing in the Pacific Coast League. He then entered the US Army and served his Country during WWII for the next two years. Though the Yankees invited him to their 1946 spring training camp, he failed to make the team and never again played big league or minor league ball. Knickerbocker was struck down by a heart attack in 1961, passing away at the age of just fifty-one. He shares his December 29th birthday with this one-time Yankee first baseman, this other former Yankee first baseman, this former Yankee pitcher, and this long-ago Yankee outfielder. It would have been nice to have had this big guy in pinstripes at the beginning of this past decade instead of toward the end of it. He hit 306 home runs during his dozen seasons in the big leagues. They included two 45-home run seasons with the Brewers and six years of driving in over 100 runs. But only one of those home runs and just six RBIs were produced after the Mariners released him in June of 2008 and the Yankees picked him up. I remember thinking it was a good acquisition at the time, hoping the then 33-year-older would be rejuvenated by the pinstripes and motivated to possibly play himself into contention to replace New York’s Jason Giambi, who’s contract was expiring that season. But Sexson, who was also in the final year of a $50 million deal he had signed with Seattle, never really got it going during his short stay in the Bronx, becoming just another move that didn’t work out during New York’s very disappointing 2008 season. Sexson shares his December 29th birthday with this other former Yankee first baseman, this former Yankee pitcher, and this long-ago Yankee outfielder. Jaret Wright’s pitching career got off to a great start from the second he was born and found out his Dad was former big league pitcher and 20-game-winner Clyde Wright. Sure enough, the youngster developed into a fireballing right-handed pitcher with a 98 mile per hour fastball and a biting curve to boot. He was in the big leagues with the Cleveland Indians by June of 1997, when he was just 21-years-old and he helped that Indian team make it to the World Series by going 8-3 during the second half of the regular season and then beating the Yankees twice in the five-game ALDS. The Indians loved this kid so much that after he won Game 4 of the World Series against the Marlins, they gave him the ball again in Game 7 and Wright responded with a six-plus innings stint of solid pitching giving the bullpen a 2-1 lead in a game Cleveland eventually would lose. Coming out of that season, Wright was considered one of Baseball’s premier young arms. 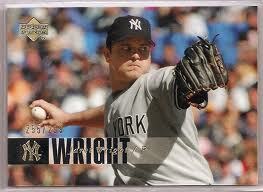 Wright then went 12-10 in his sophomore season but as the innings mounted, his pitching shoulder started aching. He lost both of his starts in the 1998 postseason and then the bottom pretty much fell out. He spent his final four seasons in Cleveland either pitching in pain or on the DL, winning just 15 decisions over that period while losing 19. The Indians let him walk after the 2002 season and the Padres took a shot with a one-year deal. After a horrible 1-5 start in San Diego, he was dealt to the Braves, a franchise well known for its handling of pitching talent. Atlanta proved to be Wright’s elixir. By 2004, he had learned how to pitch with an 89 mile per hour fastball and finished 15-8. But then he got shelled in that year’s ALDS against the Astros, losing twice and giving up 14 hits and 10 runs in the nine-plus innings he pitched. It was the Wright who pitched so well in the 2004 regular season that the Yankees thought they were getting when they signed him to a three-year, $21 million contract the following December. That was the same offseason New York also went out and signed Carl Pavano for $40 million. Brian Cashman thought he had fixed the Yankee starting pitching problems with the two deals. Instead, he had made them even worse not to mention much, much more expensive. Wright’s first year in pinstripes was a disaster. He pitched just 63 innings, spent most of the year nursing a sore shoulder and finished 5-5 with an ERA over six. He did much better in his second regular season in New York, going 11-7 but then for some reason, Joe Torre picked Wright to start game 4 of that year’s ALDS against the Tigers. Detroit held a 2-1 lead in the best of five series and when Wright got shelled, giving up two bombs, and four runs in the 2.2 innings he pitched, both New York’s postseason and the beleaguered pitcher’s Yankee career were over. He was banished to Baltimore, with the Yankees agreeing to pay more than half his $7 million salary for 2007. That turned out to be his final season in the big leagues. He finished with a 68-60 career record during his eleven injury filled seasons of play. Wright shares his December 29th birthday with this long-ago Yankee outfielder, this former Yankee first baseman and this one too. Over the years, there have been several Yankee players who had brothers who were also big leaguers. The great Yankee Clipper, Joe DiMaggio had siblings Dom and Vince. Matty and Felipe Alou were Yankee teammates for a while when their younger brother Jesus was also playing in the Majors. Clete Boyer’s older brothers Ken and Cloyd preceded the good-fielding Yankee third baseman to the big leagues. But no player on the franchise’s all-time roster could top long-ago Yankee outfielder Frank Delahanty when it came to baseball-playing brothers. James and Bridget Delahanty immigrated to America from Ireland in 1865, the same year the US Civil War ended. The couple settled in Cleveland and while James took on a variety of jobs, his wife turned their home into a boarding house. They lost their first child in infancy, but the second, a boy named Edward James would grow up to become one of baseball’s first great sluggers and a Hall of Famer. Their next three boys, Tom, Joe and Jim would also become big leaguers as would their youngest, Frank, who would be nicknamed Pudgie. The youngest Delahanty made his Yankee (actually Highlander) debut in 1905, when he was just 22-years-old. The following season, he became New York’s fourth outfielder, starting 92 games and setting a career high with 41 RBIs. That ’06 Highlander team won 90 games and finished second in the American League. Manager Clark Griffith thought his team could win the Pennant the following year if he could improve his starting rotation. In an effort to do so, Frank Delahanty was traded to Cleveland for former twenty-game-winner Earl Moore. Both Delahanty and Moore were complete flops with their new teams in 1907 and by July of 1908, Delahanty found himself back with the Highlanders. He became one of the team’s better hitters during the second half of that season but instead of re-signing with New York, he jumped to the Buffalo Buffeds in the upstart Federal League. What are Buffeds? Delahanty shares his December 29th birthday with this former Yankee pitcher, this former Yankee first baseman and this other former Yankee first baseman.